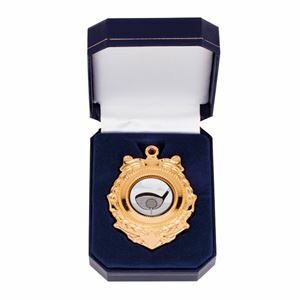 The Victoria Medallion In Box is ideal if you are looking for an elegantly classical medal design and it is conveniently sold as a medal in case combination. The time-honoured shape that the medal is cast in, outlines an honour ribbon and laurel wreath. This medal is hand polished and the reveres has a shiny finish. 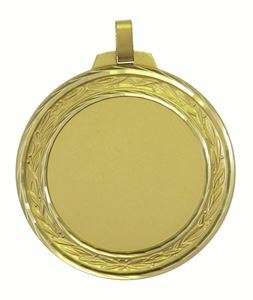 The medal has a blank centre allowing you to personalise the medal with your club or team logo. Alternatively, you can choose from our huge stock collection of FREE printed insert images. Sold in a convenient combination of a medal in a presentation box. A classical medal choice, the Triumph Medallion In Box is cast into the time-honoured shape of a crest medallion. 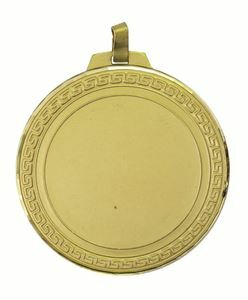 This medal is elegantly embossed with a laurel wreath and scroll design. The medal is hand polished with an antique finish and has a shiny reverse side. 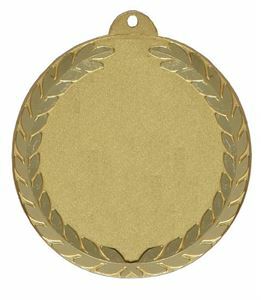 The centre is blank for you to personalise the medal with your club or team logo. Alternatively, you can choose from our huge stock collection of FREE printed insert images. The luxurious design of the Faceted Royal Medal features regal scroll edges with beautiful folds and curls. This medal is made from brass which makes it weightier and gives the diamond faceted edges a quality finish. There is a blank centre which can be personalised with your logo. This large medal takes a 50mm sized centre. Alternatively, you can choose from our huge stock collection of FREE printed insert images. The Greek design on the border of the Faceted Hellenic Medal features the classic Greek Meandros pattern. 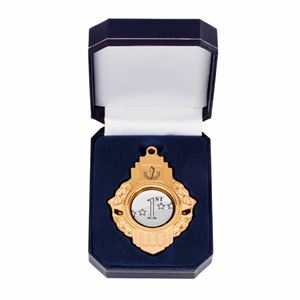 Made from premium brass which makes the medal weightier and gives the diamond faceted edges a quality finish. The medal has a blank centre which can be personalised with your logo. This large medal takes a 50mm sized centre. Alternatively, you can choose from our huge stock collection of FREE printed insert images. The Faceted Laurel Medal is cast from premium brass which gives the medal a weightier feel and renders the diamond faceted edges in a shiny two toned finish. The border design features embossed laurel leaves and the medal has a blank centre to hold your logo. Alternatively, you can choose from our huge stock collection of FREE printed insert images. This medal takes a 50mm sized centre. 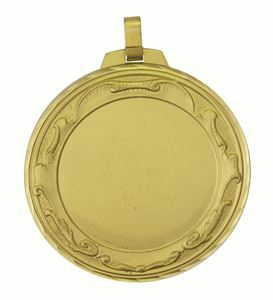 This large Maximus Medal is made from brass which delivers a weightier feel and gives the embossing a quality finish. The design is uncomplicated but striking with a stylised laurel wreath encircling the blank centre where you can place your 50mm logo. Alternatively, you can choose from our huge stock collection of FREE printed insert images.